Until recently more than 90% of what ended up in the garbage cans at the Ferry Plaza Farmers Market was compostable. Those resources, when not captured for composting, were wasted and contribute to greenhouse gases instead of renewing soils. Now all compostable items discarded in the green bin at the Ferry Plaza Farmers Market joins the materials of many San Francisco households and restaurants at the Jepson Prairie composting facility. Our new Waste Wise initiative will divert an estimated 78 tons of compostable materials from the landfill annually! Compost is formed when organic matter (material that comes from plants or animals) decomposes aerobically (with oxygen). The resulting nitrogen- and carbon-rich substance can be added to soil to improve its structure, provide and hold soil nutrients, prevent erosion, and encourage beneficial insects and microorganisms. When compostable food scraps and yard debris are sent to the landfill, not only are their valuable nutrients wasted, but they can actually cause environmental harm. In the landfill, organic materials decompose anaerobically (without oxygen), releasing methane, a greenhouse gas that is 23 times more potent than carbon dioxide. Landfills account for 34% of methane emissions in the United States. Meanwhile, America is losing its soil fertility and topsoil at alarming rates. 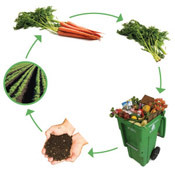 When food scraps are recycled, either in a backyard compost pile or as part of a municipal composting system, they are turned from waste into a resource and used to enrich gardens and agricultural lands. In San Francisco, that’s exactly what’s happening when you put your orange peels, compostable forks, and coffee cups in the green bin. Every day, the city sends about 300 tons of compostable materials to Jepson Prairie Organics composting facility in Vacaville. The materials are screened to remove contaminants (mainly plastics) and spread out in long windrows. A mere 60 days later, the materials have become compost. This compost is used on productive lands throughout the Bay Area, including some farms that sell at the Ferry Plaza Farmers Market. Capturing the organic resources from the market and redistributing them to farms offers a tidy and elegant solution to the waste problem: your coffee cup could end up becoming part of your tomato! Only certified compostable plastic food serviceware labeled “compostable” is accepted in San Francisco’s commercial composting program. No other “look-like plastics”—regardless of what they are made from—are allowed because they are not proven to decompose completely in the commercial composting process. No food serviceware should be labeled “biodegradable;” it’s against state law to sell products labeled “biodegradable” because the term doesn’t have a standard attached to it and is misleading.